Shown (above): 5365 DuraLast™ 100% Polyester Rose Damask Weave Form Fitted Table Skirting in Seafoam(076) and 5361 DuraLast™ 100% Polyester Momie Weave Form Fitted Table Skirting and Napkins in Rose(149). Note: Precise size of table must be submitted to assure proper fit along with template; please specify if table has a radius (rounded corner) greater than 2" or standard square corners. Table skirting is sewn directly onto the tablecloth for a perfect fit. No more clips or pins. Available in Shirred, Box, and Accordion pleats. Color match the skirting to the tablecloth or choose contrasting colors to enhance your decor. 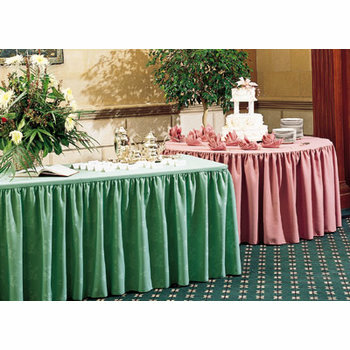 Table covers fit easily over any size banquet table, conference table, or round, oval, or square table.